Flor de pato, 1942. Collection of Brigita Anguiano. Campesino asesinado, 1940 Pencil on paper, 100 x 150 in. Courtesy of Brigita Anguiano. Mujer atómica / Atomic Woman, 1937, ink on paper. 35 x 25 in. Courtesy of Brigita Anguiano. Después del cataclismo / Aõ er the Cataclysm, 1937. Image courtesy of Brigita Anguiano. Raúl Anguiano (1915–2006) was a Mexican-born artist who participated in a variety of national and international artistic movements of the twentieth century. This exhibition presents midcentury paintings and works on paper by the artist that reflect his participation in easel painting, Surrealism, and other styles of art that expand beyond his artistic training in muralism. This intimate selection of work is on loan from the Anguiano family collection as well as from the collection of a private collector. At the age of 12, Raúl Anguiano (b. Mexico, 1915–2006) attended the Free School of Painting in Guadalajara, where he first became interested in art. 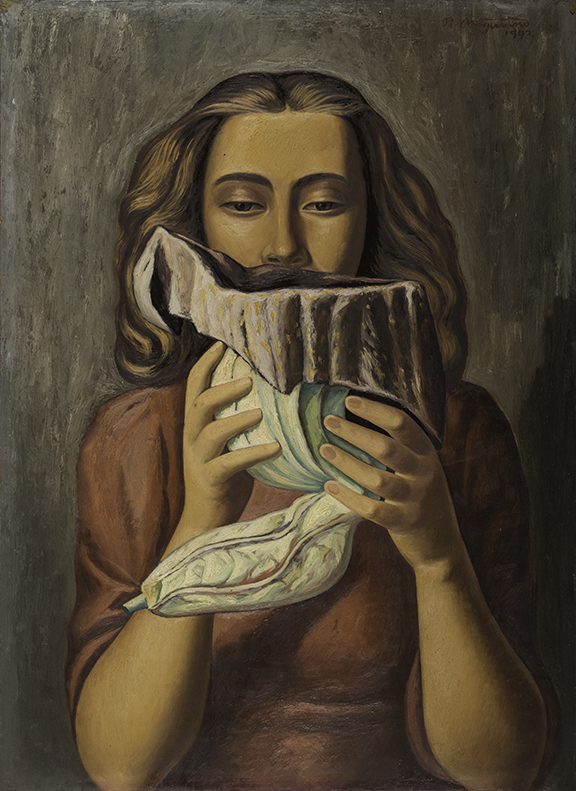 In 1934, Anguiano moved to Mexico City, and a year later, began working as an inspector of art education at the National Institute of Fine Arts, and as an art teacher at the National School of Painting, Sculpture, and Engraving “La Esmeralda.” Here, Anguiano adopted the social concerns that were often depicted in the nation’s art from the 1920s and 1930s. This exhibition focuses on an intimate selection of work created after his arrival to Mexico City.